The major fact is however that the firth thing you need to do in your battle with acne scars is to stop acne so your skin doesn’t get injured anymore! 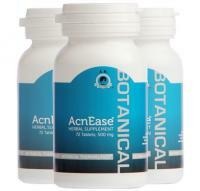 This is why I recommend AcnEase to do this since it stops the acne cascade and prevents new pimples form forming. While putting prevention first, it is definitely worth it to also look at other options that could be very helpful in managing acne scars. I think it’s important to also realize how acne scars form so you can help it not happen! In general, scars on our skin result from a wound or injury. Most superficial wounds heal without scarring. It's when the skin is really damaged that scars form on the skin. Acne scars are most often the product of inflamed breakouts such papules, pustules or cysts. Inflamed blemishes cause the pore to become engorged causing a break in the follicle wall. If the rupture occurs near the skin's surface, the lesion is usually minor and heals quickly. More serious lesions arise when there is a deep break in the follicle wall. The infected material spills out into the skin and destroys healthy skin tissue. In response, the skin forms new collagen fibers. Unfortunately, the finished "repair job" never looks as good as before the injury and this patching is called a scar. Microdermabrasion: This is a treatment that can only be done after your acne has completely cleared. Personally, I think this is a very aggressive treatment and can only be handled by a few skin types. If you are using active topicals, like alpha-hydroxy acids or Retin A, you must discontinue them for at least a week before treatment or opt out of the treatment all together. If you have even slightly sensitive skin, I would suggest another service. Also, you must have patience with this because it takes multiple sessions and the healing process also takes time. Finally – deep scars cannot really be removed by microdermabrasion, and you must have a skilled professional do the treatments. Light chemical peels: I have seen good results through chemical peels with my clients who have suffered from acne scarring. This is a good option because you can get these done while you still have some active acne (not cysts or lesions but occasional pimples), and it will make scaring less visible and skin less oily at least for a while. There are lots of different peels out on the market and it can be confusing to decide which is best for you, and what the results are going to be. The newer philosophies with peels are that the light to medium depth peels are best, as opposed to the "strip your face off" aggressive treatments that were more popular in the past. These more superficial peels can take a series of treatments to obtain the acquired results, but each time reveals better looking skin, so the process is encouraging. The best peels for sensitive skin are mandelic acid, and lactic acid, in concentrations below 20%. Glycolic acid and TCA are much more aggressive and not suggested for sensitive skin. As professional skin services are a nice supplement to personal care, your daily skincare regimen still needs to be personalized for your skin and your acne treatment must address the internal causes of acne to truly make the difference. Remember this! So let’s switch over to vitamins now. Vitamin C is great for helping fade scaring. This is a great brightening vitamin and will give your skin a more overall even tone. My favorite way to use Vitamin C at home is in the form of a lemon sugar scrub. This gives you the benefit of the brightening Vitamin C, as well as the glycolic exfoliation from the sugar cane molecule. Mix in a few drops of lemon juice with a few teaspoons of organic sugar cane and a teaspoon of olive oil. Do this scrub nightly to reveal a more even-toned brighter complexion. Exfoliation is also a key to helping scarring. Vitamin A is the king of exfoliation because it encourages your cells to shed faster from underneath, as opposed to taking off the superficial layers of skin on the surface. The post-inflammatory hyper-pigmenation that is created after a pimple has healed is occurring in the deeper layer of the skin. This is why using a light at home scrub a few times a week seems to get you nowhere when it comes to scarring. Prescription retinols do work for some people, but I always stress the importance of listening to your skin. If it feels tight and dry, use the product less. I think the best form of retinol comes from natural sources, and may take more time to work, but produces less inflammation in the skin. Rosehip seed oil is a wonderful oil to use at night. This oil is non-comedogenic, so it will not clog your pores. It is high in trans-retinoic acid and also essential fatty acids that support your skins repairing and exfoliating process. Please don't’ forget however - professional skin treatments, vitamins and oils alone aren’t going to prevent the scarring from happening. 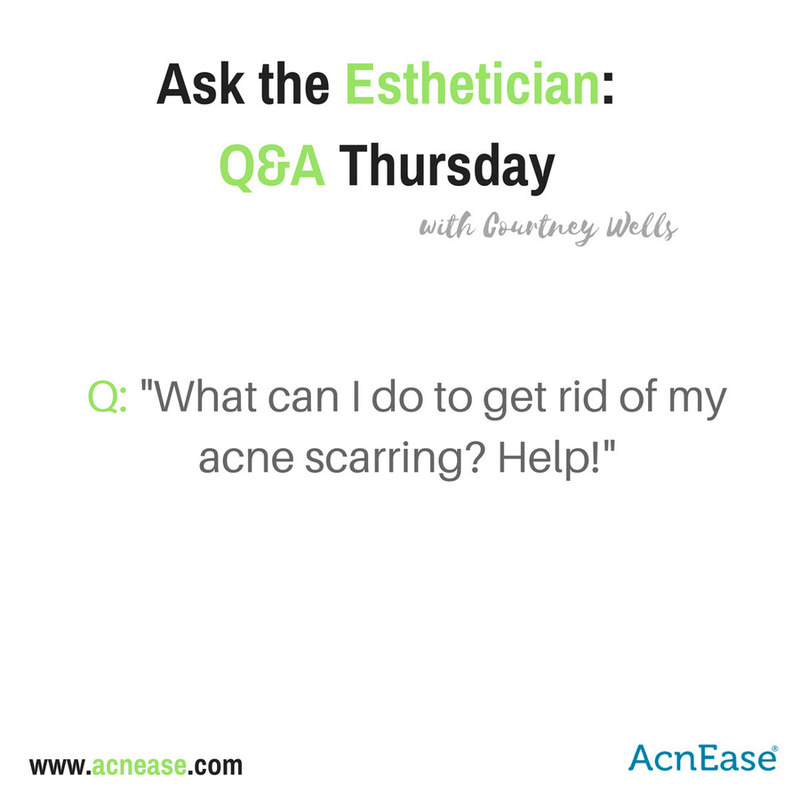 This is why I recommend something like AcnEase, which treats the imbalance from within and prevents you from having to deal with scarring in the first place! You can probably guess what I’m going to say next too…finally, we need to talk sunscreen. Contrary to some beliefs, sun exposure does NOT help your acne scars. Therefore, the continued use of sunscreen cannot be more stressed. The melanin reaction that takes places when there is inflammation around a pimple is primarily what is causing the discoloration in the skin. When the skin is exfoliated, it is more sensitive to sun and needs to be protected accordingly. If you exfoliate, but do not protect the skin, you will actually make your scars worse by making them more visible. The bottom line is if you exfoliate, which you should if you have scars, you must protect your skin against the sunrays every singe day, not just when you are in direct sunlight. So I hope this answered the question about how to help scarring. Let me know what you want to hear each week and I’ll be glad to answer! Reply to me here!